While having wine with some girlfriends this weekend, the topic of “wedding paparazzi” came up. What is wedding paparazzi, you may ask? That’s when a friend or family member attending your wedding decides that it is more important that they get photos of your wedding than enjoying the beauty of the ceremony. If you’ve been to a wedding in the last five years or so, chances are you’ve noticed that the majority of the guests have turned in to wedding paparazzi of varying degrees. With the unbridled growth of social media sites and the availability of on-the-spot photo editing through smartphones [hello, PicStitch and Instagram], everyone fancies themselves a world class photographer now. And, in relaxed, social gatherings – that’s totally fine. Lord knows I’m guilty of taking a few well-posed shots with my girlfriends at the local watering hole. It’s part of the joy of a narcissistic generation. But when does this affinity for snapping candid shots – and immediately uploading them to Facebook, Twitter, Tumb1er, etc – become an issue? When it takes you – or others – out of the moment. A close friend of mine is a very gifted photographer and she owns a business based out of Central Florida. While sipping wine with her and another girlfriend this weekend, she told me about a wedding she had recently shot where one of the bridesmaids – yes, someone in the bridal party – whipped out her iPhone and proceeded to FILM the entire exchange of vows during the ceremony. The bride and groom had hired a professional videographer (that I’m sure they paid good money for) and yet this bridesmaid felt compelled to record the ceremony on a smartphone instead of just enjoying the beauty and serenity of two her closest friends committing their lives together before God. As disappointing as this was to hear, I didn’t find it surprising. 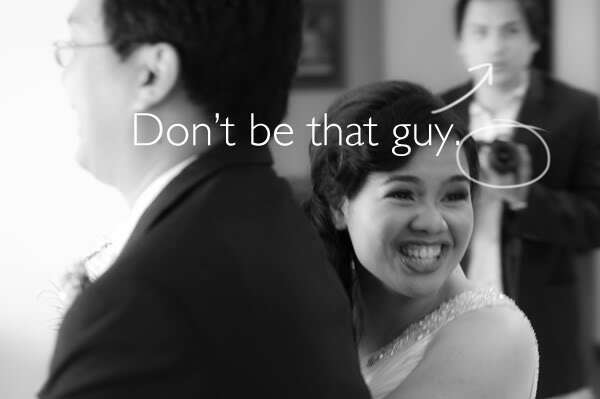 I’ve attended several weddings in the past three years, both as a guest and in the bridal parties, and the growing trend of wedding paparazzi is disturbing. Like wild boar roaming the Serengeti, we’ve managed to catch some “wedding paparazzi” in the act. Instead of tearing up as your best friend kisses her husband for the first time, you’re staring at the screen of your phone, wondering why the upload failed. I can tell you why – you and 50% of the audience next to you are all trying to post that picture to Facebook at the same time. Meanwhile, you’ve just missed one of the most emotional and touching moments – that can never be recreated – because you were hoping to get a few thumbs up. If you are a bride planning your wedding, I urge you to add to your invitations or to the RSVP slip in your envelope that you wish for your guests to be unplugged during your ceremony. Cute sign & practical! Love it! You’ve paid money for your photographer and videographer. Trust in them to do their jobs. You do not need your friends or family taking photos for you. 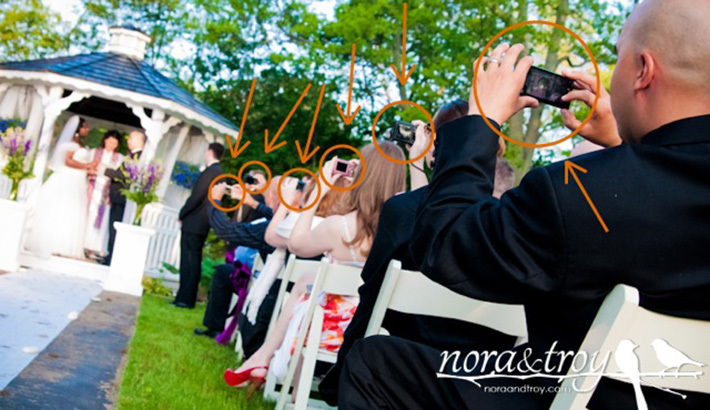 The “wedding paparazzi” often RUIN the professional photos. My photographer friend told me that she actually had a bride’s heavyset aunt step directly in front of her during the bride and groom’s first kiss, fully BLOCKING a perfect shot. The Aunt’s picture was blurry and out of focus; the photographer’s showed a flowery sundress and unshaven snow-white ankle. Lovely, right? You’ve invited your friends and family for a reason. Your guests are important to you and you’ve invited them to your wedding because you want them to share in your special day. 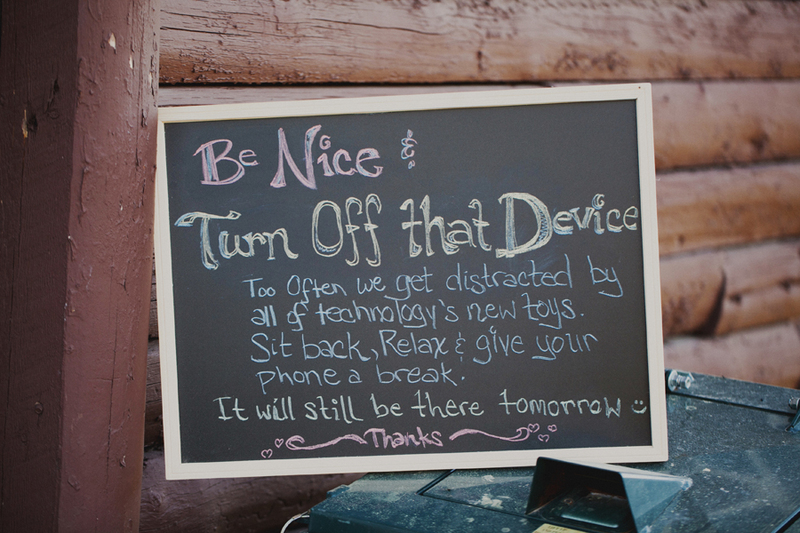 By going unplugged, you’re forcing encouraging them to be PRESENT in the moment. To fully immerse themselves in the positive experience and to really enjoy the beauty of your wedding day. As adults, you’d hope that they’d come to this conclusion themselves, but having an unplugged wedding ensures that they’ll make the right decision. If you’ve been invited to a wedding and the bride/groom didn’t specify that the wedding is unplugged, pretend it is anyhow. You’ll be able to savor the day more fully and won’t make any photographer enemies along the way. Unless, of course, you knock over one of their cameras or spill wine on them. That’s a different story all together. Seriously. We HATE that guy. OK, I would say that concludes my rant/advice for the day. 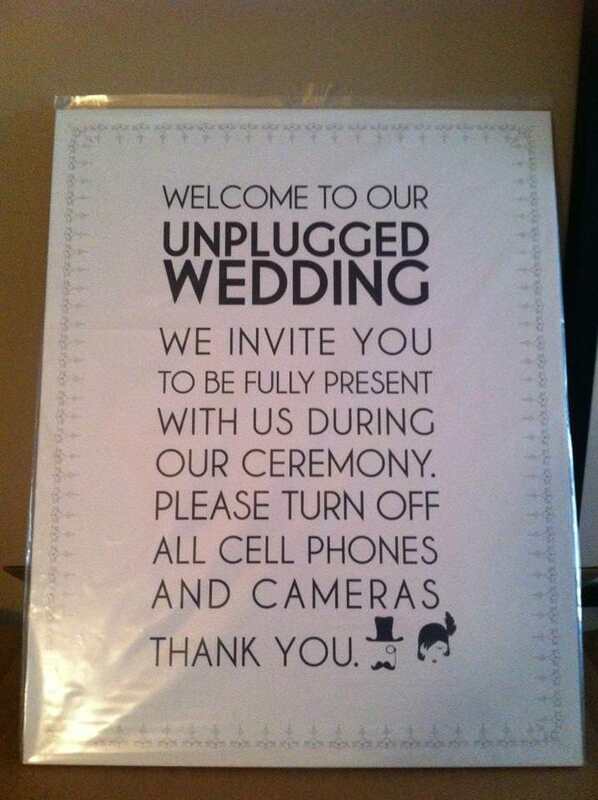 The next wedding [or graduation, bar mitzvah, etc] you’re invited to, turn that cell phone off and just sit back, relax, and enjoy. You’ll thank me for it later.